I was shocked to hear these words come out of my mouth. It was Friday night at the end of a long, emotionally and physically exhausting week. I was picking up my girls from my mom, where they had been peacefully playing and making cookies for a school Christmas cookie exchange, a long loved Shady Oak Kindergarten tradition. Who doesn’t love a good gift giving guide? Here are some of our top picks for encouraging thoughtful gift giving to those you love (including yourself)! Need a little more guidance? Reach out and we’re happy to offer a complimentary consultation on Beautycounter or doTerra gift ideas! There is a saying that, what we appreciate, appreciates. Last week on a call with a nurse coach colleague, I experienced this first hand. At the end of our call, he said, "Can I just appreciate you for a minute?" Peaceful Touch® began in Stockholm, Sweden in the early 1990s. The program began with a focus on teachers and school aides learning basic Swedish massage techniques in order to provide massage for children. Everywhere they began to introduce the program, the children themselves assimilated the basic massage strokes, and began to give and receive Peaceful Touch® with each other. Both research and instinct inform us that touch is essential to human growth and development. However, in our fast paced culture it is common for children to lack healthy touch in their daily lives. Oxytocin is known as the “cuddle hormone” and is released in the body in response to touch. New research shows that this extraordinary biochemical impacts our ability to recover from stressful experiences and promotes healing and connection by mitigating the harmful impacts of the stress hormone cortisol. Children at Shady Oak Primary School practicing the Flood Story. 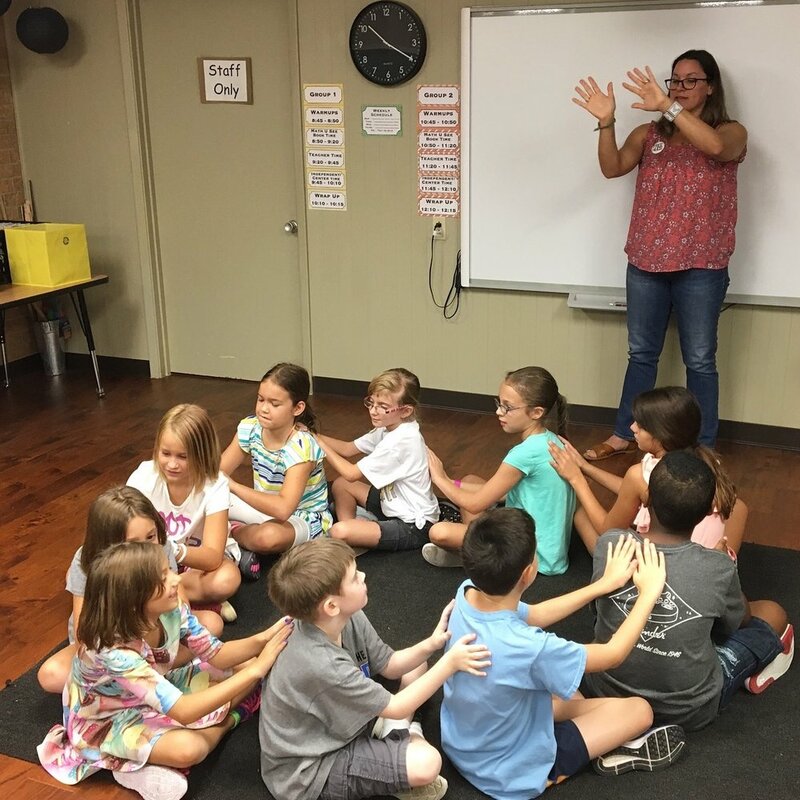 By using Peaceful Touch techniques while telling the story of Hurricane Harvey, children are integrating the cognitive and the emotional parts of their brain, while touch stimulates oxytocin release and calms the nervous system. The integration of the two parts of the brain along with the activation of the relaxation response of the nervous system can help children feel safe to work through trauma they may have experienced. Touch and storytelling are powerful ways to encourage resilience and healing in children and families and we believe that schools have the opportunity to lay the foundation for families to emerge from this experience feeling stronger and more connected. Peaceful Touch takes place in a group setting in the classroom. It is essential that children ask permission before giving Peaceful Touch and participation is optional. The permission process is crucial for teaching healthy boundaries with touch. These lessons carry over to all aspects of touch and boundary setting in the classroom, playground and even at home. Whether an adult or child was directly impacted by the storm, we believe everyone benefits from integrating the experience with resilience and strength to move forward together. For a free training in Peaceful Touch and Storytelling for your school or organization, please contact us here. Download the Flood story classroom or family activity here. If you value taking care of yourself and you want your kids to as well, consider this- none of us are getting it "right" 100% of the time. Life is messy and as long as we are committed to aligning our values with action in our health and wellness, we are heading in the right direction. We get it. You're adjusting to one of the biggest life (and body) changes you'll ever know. You're sleep deprived and elated. Perhaps anxious and blue. You're just trying to keep this little bundle of joy and poop alive, and keep yourself fed and relatively clean in the process. By now most of us have heard that multitasking is not that great for our brains or our well-being. Studies have found that multitasking may actually damage the brain, decreases our productivity and attention to detail, and leaves us feeling stressed and even unhappy. So here we are at another crossroads between knowing and doing. Because let's be honest, how on earth do we get anything done as mothers and NOT multitask at some point? If we're paying attention at all in our world, we're bound to feel anxious and stressed- and that is exhausting. So what gives? What can we do to strengthen our body's ability to handle stress? Here are a few things I'm learning. I've been loving watching the Summer Olympics these past couple of weeks. As a former competitive swimmer, I am enamored by the incredible skill and grace the athletes display, and I know the enormous amount of work and commitment they've invested in their sport. I also knew, as soon as I saw the now famous round, red marks on Michael Phelps' shoulders, that he had been using 'cupping' as part of his training program. Welcome to the first of a series of articles focused on how to select, store, and prepare vegetables and fruits to maximize their nutrient value. Based on the book Eating on the Wild Side by Jo Robinson (2013), we will explore simple, practical ways to improve your family’s nutrition. Since becoming a mom myself, I’m all about being practical when it comes to nutrition for my family. As we embark on a season filled with gatherings and events often centered around food, many of us struggle with maintaining balance. While it may be tempting to either give up on our health goals and indulge without a care or avoid gatherings altogether to not be tempted, there are ways to make healthier choices through the season without depriving yourself or your family. Wellness Coaching is a partnership to navigate the gap between where you are and where you want to be. Together we’ll discover and embrace your very best in your body and life in this moment- this very real, often messy, totally incredible moment.